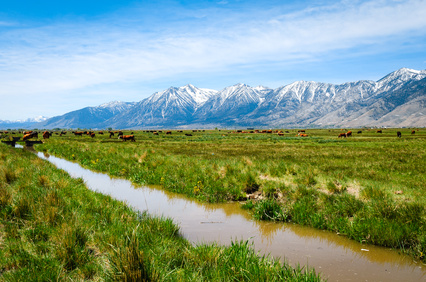 Snowpack of the Sierra Nevada mountains is an important water resource for California. Photo credit: Zack Frank. 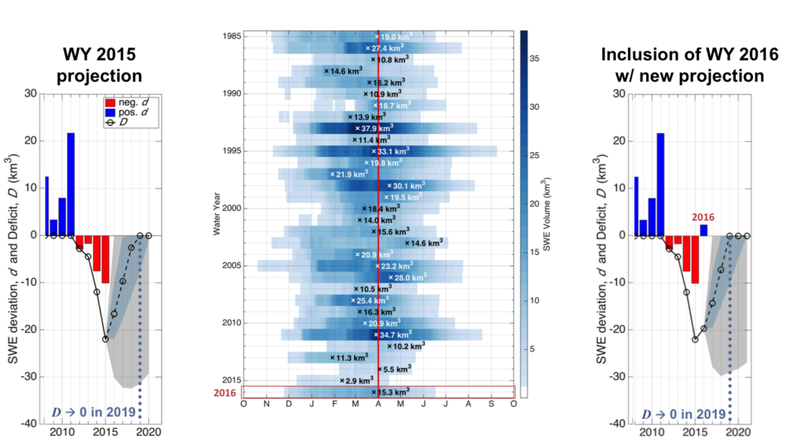 Our work developed a new snow reanalysis dataset over the Sierra Nevada that leverages the historical Landsat record from 1985-2016. The major findings of this work are that the 2012-2015 snowpack drought in the Sierra Nevada was indeed an extreme event. The water year 2015 peak snowpack was found to be the lowest over the 65-year reconstruction of peak annual snow water equivalent (SWE) and based on a fitted probability distribution had a return period of over 600 years. At the end of the 2015 water year, when our original study was conducted, we made a probabilistic projection as to how long the snowpack deficit accumulated over the 2012-2015 period would persist. At that time we found that the expected “recovery” would take about 4 years. Based on new analysis for the 2016 water year, we found that despite the fact that 2016 was a non-drought (but below average) year, the deficit is still expected to persist for about 4 years. The primary implication of these findings is that despite 2016 being a non-drought year, we are likely still feeling the persistent impact of the drought due to the historically large deficit built up over 2012-2015. We should therefore be cautious in any assessments that the drought is over. Landsat data is assimilated into our estimation system and therefore provides the key constraint on our snowpack estimates. Without Landsat data this analysis would have to be done in a modeling context or using limited in situ data and therefore would have significantly higher uncertainties. Will (or has) your work been shared with California water managers? We plan to share the dataset with water managers in hopes it will help improve their forecasting methodologies. Recovery based on the new end of water year 2016 data. This illustrates that despite the 2016 El Niño, the drought deficit is still not expected to return to zero until 2019. This work was made possible by the NASA NEWS program. This entry is filed under Carbon and Climate, News, Q&A, Water.